Item #BATMAN-HAT-1 Classic Batman Logo Hat $14.95 (ONLY HAVE 1) This officially licensed Batman logo hat is grey on the front with black mesh on the back with yellow trim, Batman logo patch is yellow & black, hat also has velcro size adjustment strap. Item #17765 Diamond Select Classic Star Trek-Deluxe Capt. Kirk in Chair Figure $44.95 ea. This new Classic Star Trek Deluxe Captain Kirk in chair has lights and sound, mint in near mint sealed box, the bottom of the chir contains a 3 position switch (try me, off, and play), a battery replacement dorr, and speaker for the various phrases. The chair`s right arm contains a button for Kirk phrases, while the left arm contains a button for ship sound affects. Each Kirk phrase is paired with a different ship sound phrase. Repeatedly pressing the left arm button merely repeats the same ship sound, there are 8 voice/SFX pairings as follows, "This is Capt. James Kirk of the U.S.S. Enterpise" computer button-pushing sound effects (actually cycles between 3 computer sound effects with each press, the only cycling use of this button.) "Lt Uhura open a channel to all decks- communications "whistle" sound effects, "Security alert to all decks. Kirk out" red alert klaxon, "position report, Spock" same computer sound effects as before., " Kirk to Enginnering. Mr. Scott, report" "direct hit" sound effect, "Prepare to attack, all hands, battle stations" phaser fire, "Chekov, arm photon torpedoes" torpedo fire, "resume course to our next destination, Mr. Sulu" engine acceleration sound effect, there is also a special constant on feature for each button. Holding down the right arm button ("Kirk Sounds") for several seconds causes Shatner`s entire opening monologue to play (sans music), with control panel lights remaining on thereafter. Holding down the ship sounds button for several seconds results in a constant looping of bridge background sounds and control panel lights. Item #07933 Classic Star Trek Mr. Spock Good Vs. Evil Pint Glass $9.95 ea. In Stock These new I Cup 16 oz. 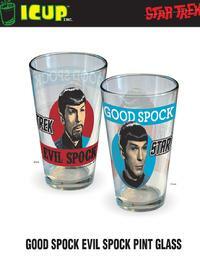 pint glass is 2 sided has good Mr. Spock on one side and the Mirror Mirror Mr. Spock on the back, each glass is brand new never been used, heavy thick glass, with no cracks or chips, about 6 1/2" tall. 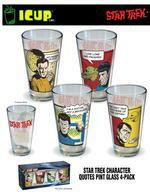 Item #09819 Classic Star Trek Pint Drinking Glasses Set of 4 $29.95 ea. set of 4 In Stock This set of 4 classic Star Trek pint drinking glasses are near mint, never been used, in a near mint never opened window box packaging, has the classic Enterprise in one corner and the Star Trek logo in the other, in each set you get 1 Captain Kirk, 1 Mr. Spock, 1 Scotty and 1 Dr. McCoy each glass is about 6 1/2" tall and holds 16 oz. art work looks like the old "Gold Key" comic book art. of each person on one side and classic Star Trek logo in red on the back, glasses should be hand washed.